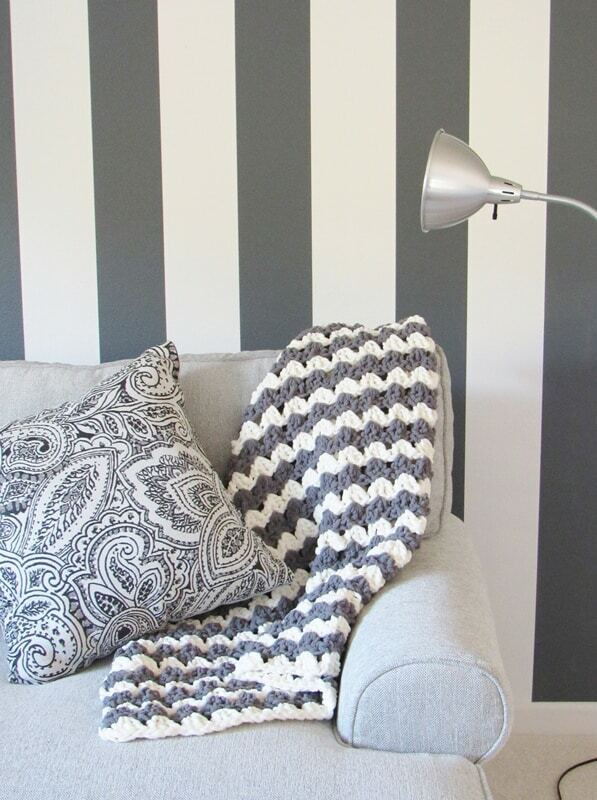 This free crochet blanket pattern can be worked in just about 3 hours including the time to weave in the ends. If you are planning on making gifts for this Holiday season, this blanket could be your best friend. All it takes is 2 skeins of Bernat Blanket yarn, 3 hours of your time and voila, you have a squishy blanket. This is a quick beginner pattern with no frills attached. The biggest challenge when designing with chenille or super bulky yarn is to keep the stitch as simple as possible so the yarn and its thickness can take the limelight. You can work from the written pattern below or purchase an Ad-free PDF copy for $1.99 here. Super Bulky(size 6) Yarn. 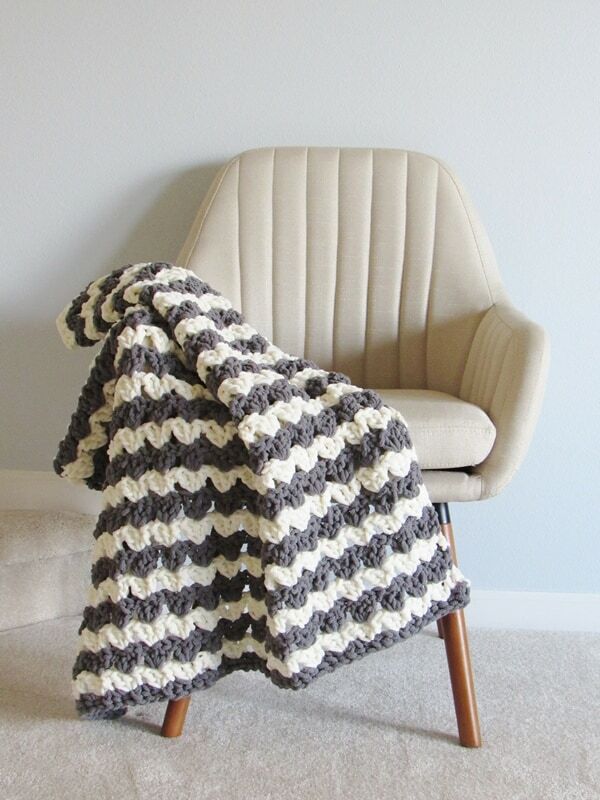 Bernat Blanket Yarn in colors Vintage White and Dark Grey were used for the afghan pictured. A Size N/P (10mm) crochet hook. A Size I (5.5mm) crochet hook for weaving in the tails. 37 inches X 36 inches. The blanket took 2 skeins of Bernat Blanket yarn, one in each color. If you are substituting with another yarn, know that each skein of Bernat Blanket contains 220 yards each. If you plan to make a bigger blanket, you will obviously need to purchase more yarn for your project. Chain 57. If you want to make a wider blanket, you can chain any multiple of 3 + 3 more chains. At the end of each row, after you join the next color, you should fasten off your previous color. Working over the yarn tails won’t work for this project. To join a new color at the end of a row, when working your last st, pull the new color through when you have 2 loops left on your hook. You will then make the turning ch in the new color joined. You can see a video on changing colors here. Repeat Row 3 until your blanket is 36 inches. 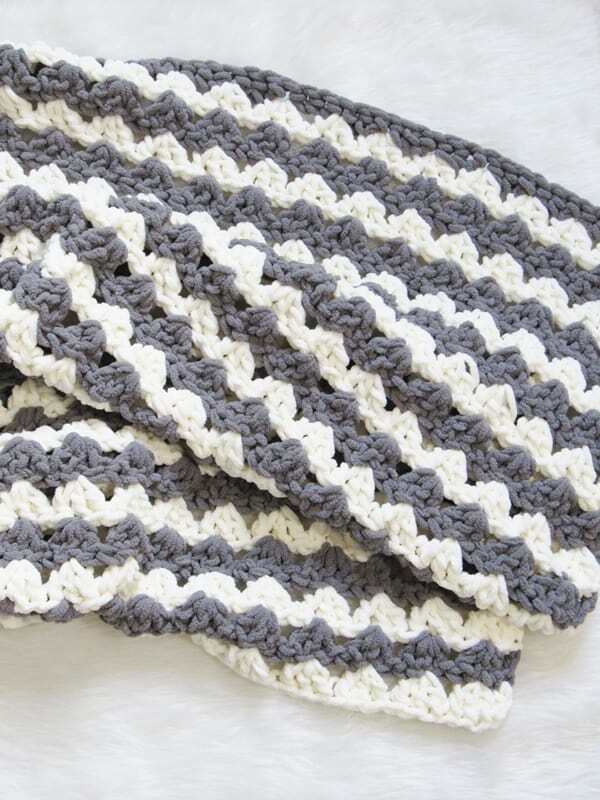 To add to the length of your blanket keep repeating this row to the desired length. Fasten off. Use a smaller I(5.5mm) hook to weave in the tails as your super bulky yarn may not fit into the eye of your regular yarn needle. Weave in the tails along the top of the triangle formations and not its base. You might also like my Textured Afghan Crochet Pattern featured on Allfreecrochetafghanpatterns.com. I’m having trouble getting stitch count to work. 57 chain, then 56 single crochet got tha. I can’t get the first double crochet row (row 2) to work out correctly. If I skip correctly at the beginning, I have too many stitches at the end or skip two at at the beginning not enough stiches at the end. I have counted and recounted stitches. Started over numerous time. What am I doing wrong? Help! You only skip 1 st after the first dc and before the last dc. You will skip 2 in the rest of the repeats. I think you must be going wrong with the first or the last skipping 1. I don’t think that’s it. Skip 1 at beginning have 3 spaces at end not 2. I did skip 1 at beginning. That left too many at the end. That’s were the issue is. And I’ve counted and recounted all stitches. Started over and recounted. Still not working out. I double checked the stitch counts and it seems to add up. Are you counting the ch1 as a st? I feel like cutting the yarn after every row leaves an excessive amount of ends to weave in. Anyone figure a way around cutting the yarn every time? This pattern is already working up beautifully! I agree, all those tails dismayed me, and I tried working them into tied tassels but it didn’t work out. However, weaving them in wasn’t as bad as I’d thought it would be and I think the fuzzy chenille will stay in place better than smoother yarn would. Nonetheless if I use this pattern again I might try using two balls of each color, one of each color on each end of the rows, so I can just drop one color and pick up the other without cutting. Then I think I could single crochet over the sides to hide the un-crocheted bits carried up over the ends of the contrasting rows. 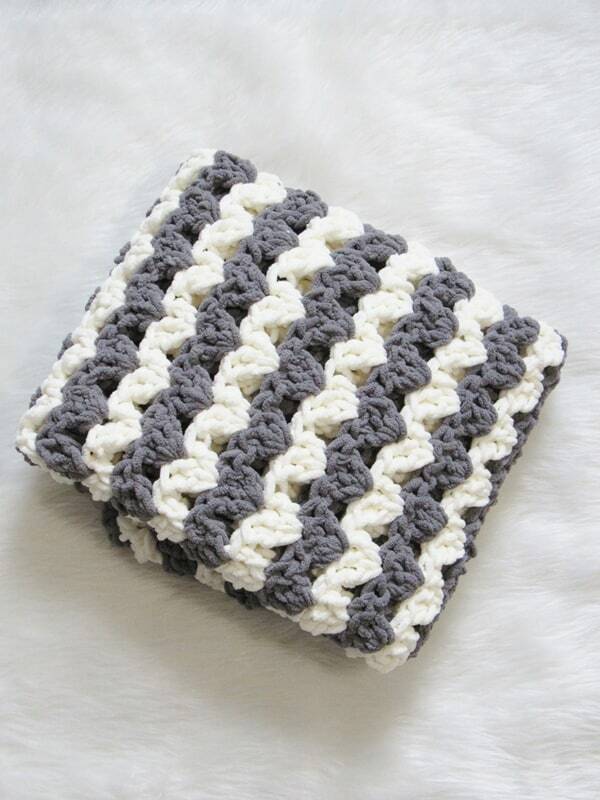 I love the look of this simple pattern and it’s a warm and cozy lap rug. I can’t get the pattern to work either. It is so simple, but I have worked hours on it. I get through Row 2. Would you please work the pattern and check that it is written correctly? I have rechecked and there seems to be no error in the pattern. Is your stitch count at the end of Round 2 correct? Are you trying to make a bigger blanket? What is your initial chain? I just figured what was wrong and edited Row 3. Thank you so much for bringing this to my attention. I had to make my tester take a second look. I have 3 stitches at the end on row 2. What do I need to fix it? I see others have same issue. See if you skipped 1 st instead of 2 in any of the repeats. Love this pattern! I didn’t any problems following your instructions. What I did get mixed up on was the time frame and yardage. So far, I have logged in a little over 6 hours and just ran out of yarn . My afghan only measures 29 X 31. I’m using Bernat Blanket yarn, not the super bulky, but it’s 220 yards. Could this be the reason why it’s so much smaller? You insight is most appreciated! Yes, a thinner yarn will make your work grow slower. It will also take up more yards to make the same size blanket. As for me, I didn’t use a thinner yarn–I used Bernat Blanket size 6– and my test gauge seemed correct but as I progressed I might have gotten tighter, the blanket seemed to be very narrow after a few rows and 4 rows equaled only 4″, not the 5″ you say it should, so I ripped it out and started over with a chain of 78 (a multiple of three + 3 as you said). 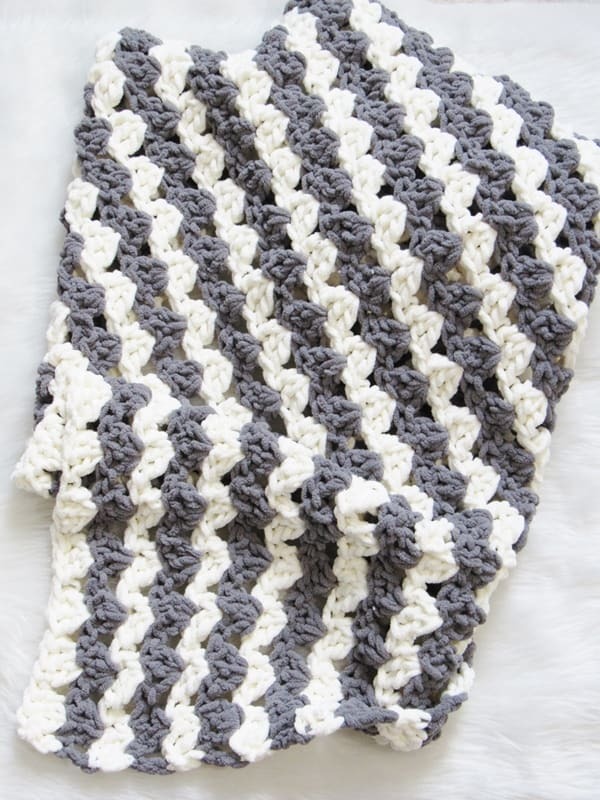 That produced a finished width of 40″ and I crocheted to a height of 40″ as well, which to me is the smallest a throw should be; only a baby blanket would be smaller than that. I wondered whether the size problem was because the instructions on the yarn wrap said use a size 11mm hook but you said use a 10, which I did; I regretted that because the smaller hook make it difficult to pull the fuzzy yarn through and my fingers ached before long. If I use this pattern again I’ll use the larger hook. In the end, I thought it needed a little something more to appear “finished” so I added tied tassels at each corner. It looks very good. Thanks for the pattern. Your gauge might have been different from mine. I am glad you finally figured what works for you. Oh my goodness! Love this pattern! So easy. Thank you so much!!! Hey Jenny, I am really glad you like it. Thank you for visiting :). can I use Lions Chenille yarn? I have not been able to read the pattern. Do you have a tutorial? I’m a visual learner. Need your assistance. You indicated you fixed the pattern, row 3, however it is row 2 that is wonky. I still have 3 stitches at the end. I really want to make this blanket, please help. Thanks!! Hi Carol, Row 2 stitch counts are correct. Make sure you are skipping 1 st at the beginning (the stitch after the very first st your work your turning chain in). Thanks, I will double check my work, obviously I did something wrong. Was a video posted. I need a video too. Hi Bridget, I will post one as soon as I can and let you know. I feel like cutting the yarn after every row will leave an excessive amount of ends to weave in. Anyone find a way around this? Love the pattern though, it’s already working up beautifully!